A diaper wipes that cleanses and soothes the delicate skin of newborns and babies. 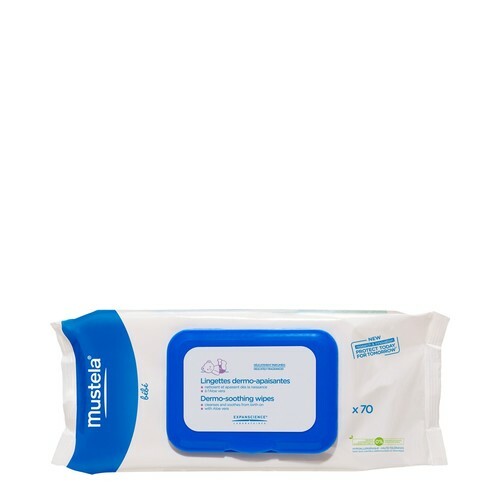 Cleanse and soothe the diaper area with the Pack of 70 Mustela Dermo-Soothing Delicately Fragranced Diaper Wipes; ideal for changing baby whether at home or whilst on-the-go. Utilising a blend of Saponaria Leaf and Root extract, the convenient wipes cleanse the area to leave baby ultra-clean. 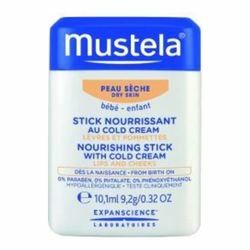 Aloe Vera and Glycerin work in synergy to deliver a soothing feel to skin, while also providing hydration and protection benefits, which leave skin touchably soft, calm and comfortable. Complete with a delicate scent, the diaper wipes envelop the skin in a subtle fragrance. • During each diaper change, clean baby's skin carefully using Dermo-Soothing Wipes – Delicately Fragranced for diaper change. 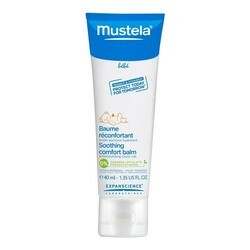 • Gently dry baby's skin then apply Mustela Vitamin Barrier Cream before putting on a clean diaper.